Jewish Humor Central: Today is Hoshanah Rabbah, Last Chance for a Lulav Shake This Year, So Let's Make it a Big One! Today is Hoshanah Rabbah, Last Chance for a Lulav Shake This Year, So Let's Make it a Big One! Well, our month of holidays is finally coming to an end. Today is Hoshanah Rabbah, the fifth day of Chol Hamoed Sukkot, and the day before Shemini Atzeret and Simchat Torah. 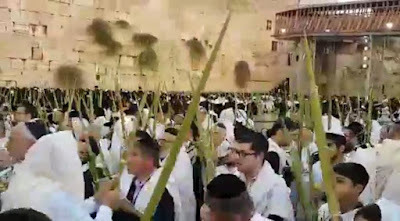 Whether or not you got a chance to shake a lulav with the etrog, myrtle and willow branches this year, we thought a video of the festivities in Jerusalem yesterday would bring a satisfying closure to this holiday period. Here's a video of the throngs gathered at the Western Wall yesterday morning to say Hallel with their Sukkot symbols. 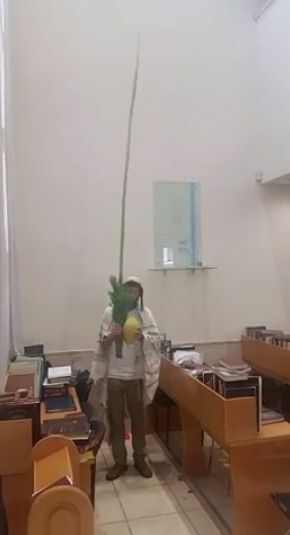 One lulav shaker somewhere in the world (we haven't located the place yet) couldn't make it to the Western Wall and did his shaking in a synagogue. This has to be the biggest lulav and etrog that we have ever seen. We'd like to see the carrying case for this giant palm frond. Watch the short video clip below the video of the scene at the Kotel. We'll be celebrating Sukkot and Shabbat for the next three days and we'll be back with more Jewish humor on Sunday.